Toulouse has a rich heritage with remarkable architecture to match. Toulouse is known as “La Ville Rose”, the pink city, named because of the pink stone used to build its churches. A renowned tourist destination, Toulouse has two Unesco heritage sites: the Canal du Midi and the Basilica of St. Sernin, which is the largest Romanesque building in Europe. It’s not just the beauty and history of Toulouse that’s attractive. It’s a thriving city, the 4th largest in France, with a surrounding populating of 1.2 million. Toulouse has seen France’s biggest economic growth in recent years, the largest population growth, AND was voted the second-best place in the country to work. The Garonne valley was a trade point for the Pyrenees, Mediterranean and Atlantic, from the Iron Age onwards. As “Tolosa” in the 2nd century BC it became a roman military outpost. Through the next few centuries Toulouse was a key city for a number of kingdoms and powers, including Christians, Catholics and Muslims. In the Treaty of Paris of 1229 Toulouse submitted to the crown of France. It was declared a “royal city” in 1271. becoming an intellectual and artistic centre. The city suffered from the Black Death, the Hundred Years’ War and famine. In the 15th century it grew again through the wine and textile industry, then, from the popularity of a blue dye called “pastel” made from the plant Woad. Architecture and fine arts flourished even more in the city from this period. The city was modernised, with some rebuilding in the 18th Century, from which some stunning feats of architecture emerged. As well as French, the region has an occasionally used dialect of French “Occitan”, one of the Romance Languages. Though English is taught across France and there are many English speakers, the majority of the time you will only find basic English spoken and the expectation of a new resident will be to speak French as quickly as possible. Toulouse sits on the banks of the River Garonne and is intersected by the Canal du Midi. It is around an hour’s drive from both the Mediterranean Sea and the Atlantic Ocean. And two hours from the Pyrenees mountain range which separates France and Spain. Toulouse is 680km from Paris, in the department of Haute-Garonne and the region of Occitanie, in the south-west of France. The south of France is warm and welcoming. Toulouse has a humid subtropical, or “submediterranean” climate due to its closeness to the Mediterranean climate zone. Winters are mild and summers hot, but not uncomfortable, and there is plenty of sunshine through spring and autumn. Annual rainfall is low and the average temperature is 20C, rising to 30C+ in summer, falling to an average of just 12C in the daytime during winter. It’s a very comfortable place to live. As a citizen of the USA you can visit France for up to 90 days. To stay longer you will need to apply for a long-term French visa (visa long de sèjour). Important note: long stay visas must be applied for before you arrive in France! Long stay visas are usually for 12 months, you will have to register at the Immigration Office (OFFI) within three months of arrival, and apply for residency later. Usually taking about three weeks, and free to apply for. A spouse visa can be granted for a 12-month period. To obtain a work visa you need to have a job in France first. You’ll need to have your work contract approved by the French Labour Ministry and then the OFFI offices. Your employer should include your family in their application file and it will take around three weeks, and cost around $100. If you are not planning on working but would like to stay for longer than 90 day’s, there is a visitor visa which takes around a month to process. As well as the usual identity documentation you will need a letter explaining what you plan to do in France, and proof that you can support yourself, proof of your accommodation and your medical insurance. For a student visa you will need financial guarantees, proof of enrolment, and other documents from Campus France. It takes about two weeks and costs $50. Students between the ages of 17 and 30 can apply for an au pair visa. You’ll need an “au pair contract” approved by the French ministry of labour, an invitation from your host family, and you will need to attend French courses. There are also scientist’s, internship, and diplomatic visas. Two months before your visa runs out you must apply for a residency permit (carte de sèjour) to stay longer than six months. You have to take all your documentation to the local prefecture to file your application. You will need to prove your family situation, financial resources, employment contract, address, and have all your identification. You will also need to prove you have a good grasp of French. There is a US Consulate office in Toulouse. The consulate can help American citizens in an emergency, help deal with passport issues and offer certain other services. You can take your pets with you to France. France accepts dogs, cats and ferrets under the following conditions. You may also take reptiles, small rodents, rabbits and birds to France. A health certificate must be issued and endorsed under the USDA. There are no direct flights to Toulouse Airport from the USA. You will need to change flights, most likely in the UK, Brussels or Paris. Not everywhere in the US has a route directly to Paris. In some cases, you could fly to Paris and make the rest of the journey to Toulouse by road or train. You may be able to take a freight liner or cruise ship and make your passage to France by sea. It would take a few weeks, and unless you have arranged space on a freighter it doesn’t mean you can take extra baggage. You would then need to make the journey from your arrival port in France to Toulouse. To transport the contents of your home, or those important belongings you wish to take with you, you must pack them, organise insurance and customs documents, and arrange transport both across land and sea. It’s a big task, and one thing that may be better to hire experts for, to make sure it’s 100% perfect. There would be nothing worse than starting your new life without your belongings. If you are shipping your possessions, you must make sure they are wrapped safely and securely and protected from damp as they could be in transit for a while. You can ship your belongings ahead of time, so they are waiting for you when you arrive. If you are going to be waiting for the rest of your items when you arrive in Toulouse, it’s important to pack what you will need immediately, and to pack appropriately for you how you will be travelling. Depending on where you are from in the USA you may want to leave behind some of your winter clothing, unless of course you are planning to explore, or ski, the Pyrenees or Alps. Remember you are moving to a country where English is not the first language. Though you will be able to order English language books online, you won’t find them in the shops. If you are shipping your belongings you may want to take some English titles with you, especially if you have children. Or consider moving to e-books. As of September 2017, unemployment in France was 9.7%.. Toulouse is a technological hub for France and is voted the second-best place in the country to work. Toulouse is home to aeronautical giants Airbus who employ around 20,000 people and at the time of writing have 553 live vacancies. Toulouse is the centre of the European aerospace industry and home to the largest space centre in Europe. There are many aeronautical suppliers and other technology and engineering firms based in the city. There are also four universities with the largest, the University of Toulouse, home to 103,000 students. Other strong industries and major employers in Toulouse include business services, personal services, transportation, trade and hospitality. The Eurocentre in the North of Toulouse is a major economic hub. You will need a good level of French language ability, both spoken and written to be able to work for a French employer. Depending on the type of role you are interested in, you may need an excellent level of French language ability. France has a national employment agency Pôle Emploi which posts jobs. There are also many jobs websites include Indeed, Monster and Craiglist, Expatica have a more detailed list. If you are planning to work in France you will need to find a job first, and then apply for a work visa. Children in France must attend school between the ages of six and 16. There are primary level schools (école), elementary or middle schools (collège) and high schoosl (lycée). You can choose from French state schools, state contracted private schools, or independent/international schools in France. Home schooling is legal in France under the guidance of the school’s inspectorate. State schools will teach in French and expect a certain level of achievement in the language. Some may offer extra support in English. Attending a French school will help children to integrate into French society faster, but can be demanding. International schools for the Toulouse area are in nearby Colomiers. They are the International School of Toulouse, and the German school Deutsche Schule Toulouse. There four major universities in Toulouse including the University of Toulouse, which is actually split into three. There are hundreds of thousands of students in the Toulouse area and a thriving student economy. Toulouse also has a number of excellent colleges including the Toulouse Business School (TBS) and the Toulouse School of Economics alongside several engineering schools. A new scheme in France makes healthcare more accessible to expats and the healthcare system there is one of the best in the world. Protection Universelle Maladie (PUMA) grants an automatic right to healthcare for those who reside in France in a “stable and regular” manner. If you have lived in France for three consecutive months and are a permanent legal resident, you can apply for public healthcare coverage. You can apply straight away if you are legally employed in France and pay into the French social security system. If you are not eligible, having private medical insurance is a legal requirement. The cost of living in Toulouse is around 11% lower than Paris. Toulouse is ranked 115th out of 523 cities for cost of living. Renting a three-bedroom apartment in the city centre will cost around 1,150 EURO per month, outside the city centre that falls to 825 EURO. A loaf of bread will cost 1.11 EURO, a dozen eggs 3.15 EURO, and a beer 1.80 EURO. A three-course meal at a mid-range restaurant is likely to cost around 50 EURO. You’ll be pleased to hear the French also drive on the right. The transport network in Toulouse is good, but there is no high-speed TGV rail connection with Paris, so it will take 5 hours on the train. There is an extensive bus system, and the Toulouse Metro, made up of automatic trains. The main rail system has regional and national services, the station is Toulouse-Matabiau. There is also a single tram line running from Beauzelle to Toulouse. An across city bicycle rental scheme, the Vélô Toulouse was introduced in 2007. The main airport is Toulouse Blagnac with a secondary airport, Toulouse Lasbordes, neither have direct flights to the USA. You can drive in France with your US driving licence but should carry a translated, notarized copy. If you are a resident of France, and from certain US states, you can exchange your US licence for a French one if you apply three months before the 12-month period is over. For other US states you will have to take the French written and practical driving tests, once the 12-month period has expired. More information on eligible and un-eligible states can be found here. Minimes – Just north of the Canal du Midi, this area is a mixture of apartments and houses. It is a quiet area, but is just 10 minutes from the heart of the city by bus. Côte Pavée – A residential area to the south-east of the city, made up of modern apartment buildings in a calm atmosphere near the Canal du Midi. 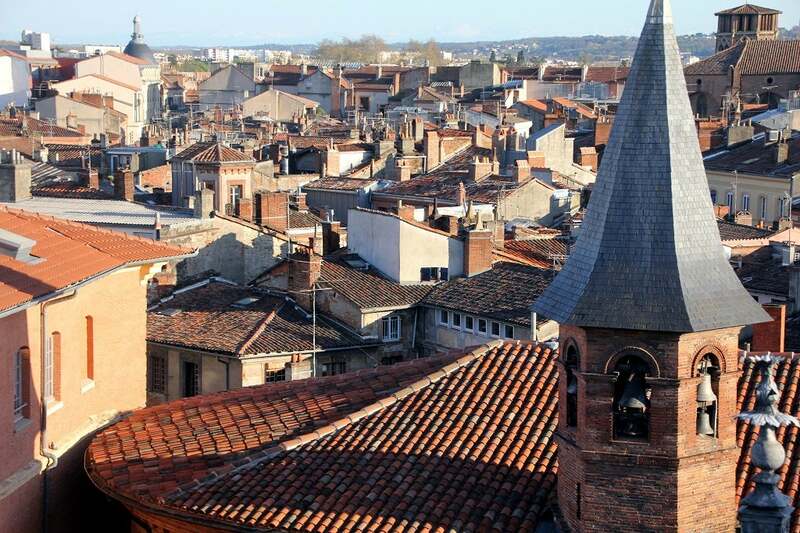 Saint Etienne – Located in the centre of the city, southeast of Place Esquirol, this is where the aristocrats of Toulouse built their own houses. It remains the most expensive area in the city to this day with many luxury and antique stores. Saint Cyprien – Previously little known despite its closeness to the city centre, Saint Cyprien attracts everyone these days. It is a melting pot of cultures and styles and its current popularity is pushing property prices upwards, nearing those of the city centre. Les Carmes – The area around place des Carmes is a stone’s throw from the city centre. Its medieval style streets are an important part of its charm, and it is a lively and popular spot by day and by day. Toulouse is a major tourist destination in France for those seeking its beautiful architecture, colourful history, and endearing French culture. You can explore the coral coloured shopfronts and churches in the “Vieux Quartier” (Old Quarter), or the newer areas of the sprawling metropolis. Toulouse is lively and hectic, but with an old-world charm. As Toulouse is so close to the Atlantic and Mediterranean coasts, the Pyrenees, or Spain just across the border, many locals enjoy the city on a Thursday, then head out of the city over the weekend. Toulouse is also close to Biarritz, the Dordogne, Carcassone and Languedoc for exploring. Or, take a drive through the many, surrounding, beautiful villages. You can visit 18th Century Château’s or tour the quintessential French vineyards just 40 minutes away. Within the city itself there are many historic buildings, churches, galleries, and museums. There is a strong expat community and a large international student population in this welcoming French city. In July each year a travelling world music festival, the Convivencia, follows the course of the Canal du Midi. In March there is the Flamenco festival, June the Rio Loco festival. October sees Cinespaña, and a major antiques fair in November. One of the most interesting events for expats is the Grand Falconer’s Festival in Cordes-sur-Ciel in July, one of the oldest medieval festivals in France. Toulouse is home to Stade Toulousain, one of the most successful rugby union clubs in Europe. There is also a successful rugby league team and “Ligue 1”, premier league, football team, Toulouse FC. The Stadium Municipal often hosts major rugby and football matches. Many other sports are popular in the area, there are water sports centres, golf courses and swimming pools. The Pyrenees mountains are popular with hikers and skiers.